You know that laryngoscope blades must be covered after reprocessing. You likely read about that, heard from a colleague, or attended an educational session. Or you learned the hard way from your Joint Commission Surveyor who dinged you during a recent inspection. However you learned, it’s safe to say your blades are covered now. What about your laryngoscope handles? There is growing discussion around whether handles need to be covered, and of course, how to check light functionality without removing handles from their covers. First things first: the rules. You may not be required to cover your handles, yet. The CDC and Joint Commission are quite clear on covering blades but the language around covering handles is less clear. Some states may already require that laryngoscope handles be covered after reprocessing, and many healthcare systems are moving toward covering handles because they predict the requirement is coming soon. Why go to the trouble of disassembling, cleaning, disinfecting, potentially sterilizing, and reassembling handles, then NOT cover them after? Seems pretty silly. How do you know an uncovered handle has been reprocessed? You don’t know. How do you know an uncovered handle hasn’t been cross contaminated? You don’t know. Just one contaminated handle in a drawer full of uncovered handles can contaminate the whole drawer. When the handle and blade are connected they become one device. The handle can contaminate the blade, either through hand contact or when the blade is folded down to rest position, when the tip of blade - which is the part that enters the patient the furthest - comes in direct contact with the handle. Should the spaulding classification then include the handle as a semi-critical device, which would then require the same reprocessing and packaging requiremetns as blades? Seems reasonsonable, right? So why NOT cover handles after reprocessing? We hear this sometimes: “We low-level wipe our handles in anesthesia and put them back in the drawer. It’s fine. We’ve done it for years.” There are a lot of things we used to do that we don’t do anymore, and for good reason. This is one of those things. Another topic being reviewed frequently is how handles are reprocessed. Is low-level wiping by anesthesia or emergency services adequate? Consider this: Anesthesia, respiratory nurses and emergency care workers cover their hands before intubation, right? They don’t want their hands to contaminate the patient and they don’t want the patient’s saliva or blood to contaminate them. It makes sense, bodily fluids can transmit all sorts of nasty stuff. But let’s say you didn’t wear gloves while intubating a patient, which is essentially the same thing as using an uncovered laryngoscope handle. Would you just wipe your hands with a low-level disinfectant when you were finished? Of course not. So why is it OK to simply wipe the handles down before using on the next patient? And who’s to say that the handle you used was even wiped down at all? There’s no way to confirm it. Do you trust everyone you work with? Every time? Several leading healthcare systems are examining how they reprocess and package laryngoscope blades and handles. There is a concerted effort to send all facility blades and handles to Central Sterile Processing for disassembly, thorough cleaning, disinfection and often sterilization. This makes perfect sense. Sterile processing professionals are certified to reprocess instruments and they have the supplies, tools and focus to do it safely and efficiently, every time. Here’s an example process from a leading healthcare institution who recently implemented enhanced procedures for the reprocessing and packaging of laryngoscopes. They shared their work so that it could help others improve their process. Yes, covering handles can be pain. It’s an extra step, adds some cost, and if you’re using a plastic bag or peel pack, you may have to remove the cover to test your handles, then recover it again. Have you considered laryngoscope handle covers? They keep your handles covered and allow you to check your lights without opening the package. 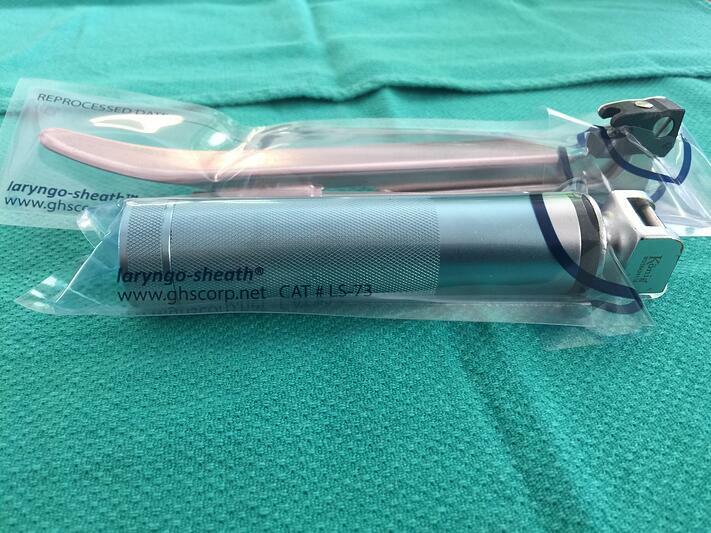 The laryngoscope handle covers are applied after reprocessing, at the point they are reassembled and checked, so they are compatible with any process. If you were the patient, you would want that handle thoroughly reprocessed AND covered. Right?